The following article in this issue’s column comes from a collaborator who took the initiative of sending us the results of a particularly interesting study on the peasant question in the U.S.S.R. The article deals with a specific subject and concretely illustrates the difficult concrete conditions in which the Soviet communists had to build socialism in the early twentieth century. The article details one of these conditions, the weak development of the productive forces in the U.S.S.R., a country where peasants constituted the majority. The article should be considered as one more contribution to the continuing debate aimed at understanding the actions of communists by looking at the conditions in which they acted. The observation has often been made that, contrary to what Marx expected, the first proletarian revolution broke out in an economically backward country where the majority of the population were peasants. That is why the issue of a worker-peasant alliance was so critically important in the Soviet Union. It is well worthwhile, then, to take a close look at what became of the worker-peasant alliance from 1917 on. February 1917: Tsarism collapses. From this moment on, the peasants are looking ahead to an agrarian reform. In fact they do more than look and wait. Starting in March, some peasants, especially the very poor and those returning from the front, set fire to the big landlords’ farms and seized the crops. The pent-up hatreds against the feudal lords burst out before the bourgeoisie had decided to do anything about agrarian reform. In fact, the bourgeoisie never did do anything about it: Tchernov, the Socialist-Revolutionary Agriculture minister in Kerensky’s government, declared that he would not tolerate any spontaneous action by the peasants before the Constituent Assembly met. Let those who contemplated any “extreme” actions be fairly warned. The peasants had no intention of sitting and waiting. In August, there are 500 recorded cases of land-seizures by force. In September, there are another 1000. The working class faces a clear choice: support the mass movement or let the government crush it. The Bolsheviks were the only ones to take a clear stand: take advantage of the situation to overthrow the provisional government. The working class thus enjoyed the support of the mass of peasants when it took power since, in the same blow, it was protecting the peasant movement and ensuring that the land would be redivided among the peasants. The first act of the new State was the adoption of a land decree. The support of the peasantry for the new State was based on the ability of that State to carry out the bourgeois-democratic revolution to the end, not its proclaimed objective of building socialism. The Bolshevik revolution meant the transition from feudalism to capitalism in the contryside. The situation was to change very rapidly. Civil war and famine swept the country. The front and the towns had to be supplied. That meant that the peasantry must agree to hand over all the grain beyond the amount necessary to meet its own needs. The situation of war and famine did not permit elaborate campaigns to be organized to explain all this. It was decided to send armed detachments of workers to requisition the grain. First the civil war, then the grain war. The peasant thus had a dual attitude to the Soviet State. On the one hand, he could see that it was the only thing stopping the landlords from coming back to repossess the land. On the other, grain requisition made him hostile to the same State. The petty entrepreneur peasant saw the grain as the product of his labour. He should be setting the price of its sale. The Soviet State, caught in the grips of famine and war, had neither the time to talk nor the wherewithal to pay. The peasants reacted in two ways to the detachments that came to requisition their grain. At first they hid their extra grain. Later, they simply did not produce more than what was necessary for the survival of their own family. This of course only made the famine worse. It is easy enough to see what kind of contradiction can develop between the peasantry and the working class. The Soviet State was first obliged to do what was necessary to supply the front and the towns and then later it had to collectivize agriculture. The first task was thus not carried out through persuasion but by military compulsion. This could not avoid undermining the accomplishment of the second task. The situation was not due to anyone’s will or to the political line of the bolshevik party. It was the product of two objective factors: civil war and famine. The contradictions between the working class and the peasants came out after the civil war over in a series of peasant uprisings. The Soviet State was in a critical situation. It had to redefine its relations with the peasantry. The redefinition of those relations was contained in the New Economic Policy (NEP). It had two goals: (a) to revive agricultural production so that the needs of the towns could be supplied; (b) to strengthen the worker-peasant alliance which had been shaken somewhat, by making concessions to the peasantry. Concretely, Lenin proposed that grain requisitioning be replaced by a tax in kind. No longer would the State commandeer from the peasant all the grain above and beyond what he needed to just survive himself. A specified amount would be taken in the form of a tax and the peasant would be free to sell the rest, either to the State or to private buyers. The development of commodity exchange and competition is obviously capitalist. But that is what was necessary to stimulate agriculture in the conditions of devastation that the Soviet Union faced. The economic basis to the worker-peasant alliance was necessarily the exchange of grain for the industrial products needed by the peasants. If the Soviet State had been in a position to provide the peasant all the industrial products he wanted then it would have been able to buy up all that the peasants produced in exchange. But Soviet industry was not in a position to do this; hence the State made it legal for the peasant to engage in private exchange and thus develop competition and production for a market. The peasantry responded very well to the NEP. The taxes in kind were readily paid. Agricultural production improved markedly. In 1926-27, the pre-war level of production was exceeded by 6%. The one exception was cereals, which were slightly behind. There was a big jump as well in trade between the towns and the countryside. At the same time, the inequalities in land holdings, amount of instruments of production to work it with, etc. led inevitably to increased social differentiation among the peasants. 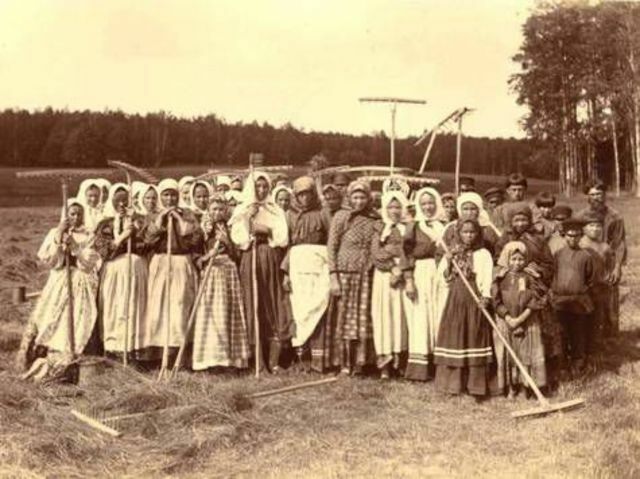 The middle peasants who mostly owed their origins to the 1917 land decree, were the biggest group. A Soviet source from that period estimates that in 1926, 67.5% of the peasants were middle peasants, 29.4% were poor peasants and 3.1% were rich peasants. Agricultural production developed considerably in this period. But the socialist sector remained very small. In 1926-27, 96.7% of agricultural production was due to the private sector. The co-operative sector accounted for a mere 3.3%. Only 2.9% of the farm population was involved in collective production. In 1927, socialist agriculture was but a tiny island in the middle of a vast capitalist sea. In 1927-28, the harvest was not as good as it had been the year before. It was 73.6 million tons, down 2.8 million. The take from the tax in kind was thus expected to be a bit lower. In fact, there was a major drop. The crops and other products taken in from July to October 1927 were on a base of 3.74 million tons as compared to 3.96 million the year before, a slight drop. But in November and December, the reduction was 55%. It was a crisis situation . The supplying of sufficient food to the cities was far from assured. The whole industrialization plan and export trade were threatened. The party’s response was to adopt the “emergency measures” – the grain held by the kulaks (rich peasants) would be requisitioned. However, most of the grain was in fact held by the middle peasants since there were so many of them they accounted for the bulk of the production. To meet their quotas, the local cadres had no choice. They had to apply the emergency measures to not only the kulaks but to the middle peasants too. This was a violation of the principles upon which the NEP was based. The worker-peasant alliance was shaken. The Soviet State found itself faced with a new contradiction. It was still unable to provide the peasants with all the industrial products they needed, and thereby to pay for the whole crop. The peasants ended up holding on to some of what they produced. The State was obliged again to resort to compulsion to get it. The Central Committee of the Bolshevik party was aware of the errors that had been made with regard to the middle peasants. It decided to go back to the NEP policies again. But the relaxation of pressure led to a vertiginous plummeting in the yield going to the State. The party was forced to go back to a broad application of the emergency measures. The kulaks exploited the situation to the hilt and increased their political influence among the middle and poor peasants. The extremely weak presence of the communist party in the countryside made it all the easier for the kulaks to succeed in this. A vicious circle set in. The tension created by the implementation of the emergency measures made it more and more difficult to relax the pressure again and withdraw the measures. Emergency policy became regular policy. We are almost back to the requisition policy of the civil war period again. Tension built up to a peak by the end of 1929. The newspaper Pravda reported that there had been some 2,000 different peasant demonstrations during that year in the Moscow region alone. Things could not continue on like that. The revolution was at a great turning point: the party decided to turn from the NEP to collectivization. The emergency measures produced the same effects as the requisitions had during the civil war. The acreage that was planted diminished which made supplying the cities all the more difficult. The party concluded that the solution was rapid development of the socialist sector of agriculture. The first stage of the farm collectivization movement was from June to October 1929. The percentage of peasant families on the collective farms went up from 3.9% to 7.5%. Most of those who joined the kolkholzes were poor peasants. It was essentially a voluntary movement. In late 1929 and early 1930, administrative pressures started to make themselves fully felt. The Soviet government set a objective of 50% of agricultural production coming from the collectivized sector by the end of 1930. The expropriation of the kulaks began. A number of documents indicate that that this phase of collectivization was mainly forced. The bare statistics alone show this: in March of 1930, 59% of peasant families were on collective farms; by October of 1930, that percentage was down to 21.7%. What had happened in the meantime was that Stalin himself had condemned the forced way in which collectivization had been carried out in many places. After Stalin’s intervention, a decree was issued on March 15, 1930 which enabled the peasants to decollectivize if they wished. Sanctions were taken against those who were found responsible for the excesses. However, the party determined that the industrialization plan could simply not be carried out with only 21% of the peasant families in the collective sector. Hence, the 16th party congress, which took place in the summer of 1930, reaffirmed the necessity to carry out a widespread and rapid collectivization. The collectivization movement started up again in early 1931. By 1932, 61.5% of the peasant families were on collective farms. The victory of collectivization was assured. The movement continued on at a slower pace until the process was completed in 1937. The price paid for collectivization was very high. The peasants who opposed collectivization slaughtered their own livestock. There was a dramatic drop in livestock production between 1929 and 1934: the horse herds were down 55%; cattle were off 40%; sheep dropped 66%; the number of pigs declined by 55%. Cereal production got worse also. The pre-war levels of production were exceeded by a small amount in 1930, which was an encouraging achievement. But it dropped the following year. It was even worse in 1932, dropping 15.6% below the 1926-27 level which had been the best year of the NEP. The pre-war levels would not be reached again until 1948 in the case of cereals and 1953 for livestock. The immediate result of this was the reappearance of famine which had disappeared during the NEP period. Rationing was reintroduced between 1931 and 1935. Theft of grain became a capital offence. Social tension increased. The working class had increased in numbers in the last few years. Industrialization was directly threatened. The number one priority was to feed the workers in the cities. Historian Moishe Lewin estimates that one million peasants died of hunger between 1932 and 1935. How was it that the worker-peasant alliance had come to the point of breaking down? The confluence of two factors must be taken into consideration to answer that question: the relative economic backwardness of the Soviet Union and the hostile imperialist encirclement. If the Soviet Union was to avoid becoming a primarily agriculture and natural resource extraction based economy, which would have condemned it very quickly to become dependent on the developed capitalist countries, it absolutely had to develop its industrial base. Surrounded by enemy forces, the Soviet Union could only rely on its own internal resources. Industrialization required more workers and the accumulation of foreign exhange gained from the export of agricultural products. The problem of supplying the cities became sharper and sharper because: (a) there were more and more workers in the cities; (b) the workers came from the countryside, thus there was a simultaneous reduction in the agricultural workforce; (c) a sizable chunk of agricultural production had to be exported. It is highly unlikely that petty commodity production from individual plots could have met this constantly increasing demand. The Bolshevik party was certain it was impossible. Agriculture absolutely must be mechanized and that could only be accomplished through collectivization. The mass of middle peasants who had made all they had by taking advantage of the NEP policies were not particularly interested in abandoning the approach which had worked well enough for them. It must be understood that the middle peasants were small-time capitalists who were mainly interested in selling the commodities they produced. The almost complete absence of communists in the countryside made the prospects for carrying out a patient struggle to persuade the peasants slim indeed. The field was left pretty well clear for the kulaks to operate and they managed to exercise significant influence on the other peasants. Thus when the drive for collectivization got under way, the majority of the peasantry opposed it. This is shown by the fact that the expropriation of the kulak measures which were supposed to be applied to rich peasants only were in fact applied to 15% of the peasants. Kulaks were only 4% of the peasant population. The scope of the repression does not mean that the State organs were striking out blindly. What it does mean is that the kulaks had considerable influence on other peasants and that the hostility of the middle peasants was very measurable indeed. By 1932, agriculture was in large part collectivized but the collective farms were filled with peasants hostile to the Soviet State. Many peasants slaughtered their livestock and worked as little as they could get away with. And although it happened less and less often with the passage of time, some even engaged in local rebellions and killed communists. It can be said therefore that collectivization led to the breakdown of the worker-peasant alliance. This is not to say that the breakdown was the product of a conscious political decision either. The explanation lies rather in the factors that brought about the political decisions that were taken during this period. Those factors come down basically to the economic backwardness of the country, the dominant position of petty commodity production in the economy and hostile capitalist encirclement. The immediate effect of the breakdown of the alliance of the two labouring classes was an important shrinkage in the basis of support for the Soviet State and Bolshevik party. Before collectivization, the party was basically concentrated in the towns but it enjoyed the support of the majority of peasants who were satisfied with the NEP. After collectivization, that support waned considerably which made it all the more difficult to recruit new party members in the countryside. The Soviet State had to do something to make up for this weakness. It had no choice but to develop a bureaucratic and extremely repressive State apparatus. Collectivized agriculture had to be supervised. Grain stealers had to be hunted down as did all those who speculated on the black market, etc. Those were all things that had to be done all right, but doing them required a bureaucracy and repressive apparatus. This brief analysis certainly does not answer all the questions that need to be answered about the history of the relationship of the peasants to the Soviet State. To begin with, a study of how collectivized agriculture developed in subsequent years need to be done. Further, such an analysis would have to be tied in with a look at the industrialization and concomitant growth of the Soviet working class. Finally, a closer look should be taken at the impact of balance of power between classes and countries on a world scale on the internal situation in the U.S.S.R. It is already clear though that the backwardness of the Russian economy, of which the numerical preponderance of the peasantry is but one aspect, put the Soviet State up against a lot of contradictions from the very start which could not be resolved through sheer will power. Tragically, the very moment that the Soviet Union achieved the socialization of agriculture it found itself, to use Lenin’s expression, shackled with the most elemental task of any society: fighting off famine. For more detailed analysis of Bolshevik agricultural policy between 1917 and 1922, see Robert Linhart. Lenine, les paysans, Taylor, Paris, Le Seuil, 1976. On NEP, read volume 32 of Lenin’s Collected Works, especially the pamphlet “The Tax in Kind”, pp. 329-365. This study, carried out by S.G. Stoumiline for the central bureau of statistics, was based on the classifications proposed by Lenin. The poor peasants are classified as those who do not get enough from the land to live off; they are obliged to do some work for pay. Middle peasants have a slight surplus which enables them to accumulate savings. Rich peasants have a constant and large surplus. They are thus able to accumulate savings and to exploit other strata by hiring on wage labour, engaging in money-lending at high rates, etc. For more statistics on the countryside during the NEP, see Charles Bettelheim, Class Struggles in the U.S.S.R., Second period: 1923-1930, (vol. 2), MR Press, 1978. According to Bettleheim, the shortage of industrial goods is due to errors made by the Bolshevik party. Those errors were connected to the line on industrialization promoted by the majority of the Central Committee. This fact was confirmed by articles published bv a number of Bolshevik leaders in 1928 and 1929. The number of party members in the villages went from 0.26% of the total peasant population at the time of the 13th congress (1924) to 0.37% at the time of the 14th congress (1925). In 1929, there were only 242,000 party members in the rural areas out of a peasant population of 120 million. Here is one example: in mid-February 1930, the delegates to the meeting on collectivization in the Sosnovski district received the order to collectivize the localities assigned them within five years. Those who failed to fulfill their quotas would be hauled before the judicial authorities within 24 hours. Cited in Bettelheim, op. cit., p. 447 (in the French version). Stalin, Le vertige du succes, Oeuvres (Works), vol. 6. The report presented by Stalin to that congress can be found in volume 12 of his Collected Works. Helene Carriere d’Encausse, Staline l’ordre par la terreur, Paris, Flammarion, 1979, p. 32. Re-blogged this in it’s entirety. The upshot is, that Bolshevik communism enjoyed dramatic support within the cities, but the peasants who were the vast majority were non committal. The Bolsheviks decided, that despite the majority which the peasants represented in Soviet Russia, they would force them to bend to the minority – with violent assault. So the peasant rebellions were put down and the majority farmers were forced to accept the rejected minority. Not exactly Power To the people, For the people or even BY the people. And I thought Catholicism was an evil. Democracy truly is a myth – in reality, whoever holds the greater wealth can afford to pay the sell swords.